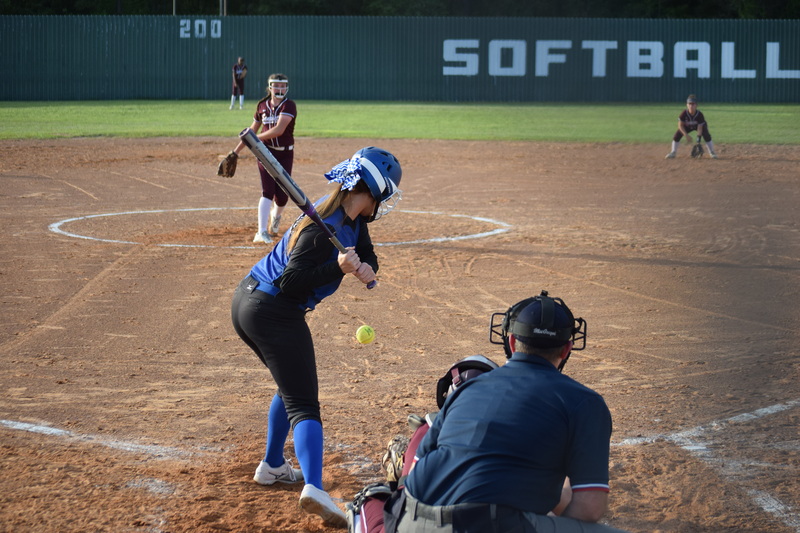 GRAPELAND – The Grapeland Sandiettes rallied back from a five run deficit to nip the Slocum Lady Mustangs by a final score of 6-5 and re-take sole possession of first place in District 21-2A. The Sandiettes came into the game with a district record of 5-1 while Slocum came in with a mark of 6-1. 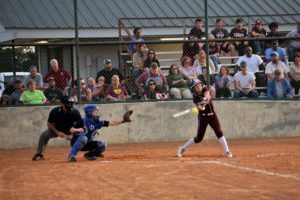 Grapeland’s lone loss happened on Friday, March 31 in an error plagued game against the Centerville Lady T igers, while Slocum’s loss had come at the hands of the Sandiettes two weeks earlier. The Tuesday, April 4 game saw a matchup of the top two teams in a battle for playoff seeding and for the first three innings it looked as if the Lady Mustangs might get the better of the Sandiettes. Cadie Belle Currie was in the pitcher’s circle for the Sandiettes and early on it seemed as if the Lady Mustangs had figured out the freshman phenom. After a relatively quiet first inning, Slocum took a 1-0 lead during the second. Taylor Clark struck out to open the inning but Briley Evers followed with a hard hit ball back to Currie that was misplayed for an error. Christy Dunnam came in as a courtesy runner for Evers and advanced to second when Courtney January grounded into a 5-3 force. 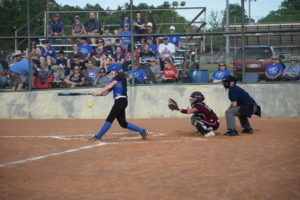 Shelby Bowman followed January in the batting order and on a 1-0 pitch, Bowman lined a double into left field to plate Dunnam with the game’s first run. After Laney Lasiter grounded out to end the top half of the second, Slocum’s Jalyn Fletcher mowed the Sandiettes down in order in the bottom half of the inning. Fletcher, who shut the Sandiettes’ offense down in a relief appearance the first time the two teams played, got Hannah Chipman on a pop up, retired Madison Holbrook on a grounder to first and forced Madi McCombs to line out to second to end the inning. The third inning saw Currie give up a single to Jessi Ives while Fletcher yielded a hit to Taylar Mullen but that was it for the offense as the Lady Mustangs took a 1-0 lead into the fourth. Slocum threatened to blow the game open in the top of the fourth as they plated four runs to take a 5-0 lead. Taylor Clark reached first on an error and moved to second when Evers walked. Dunnam came in once again for Evers at first and when January laid down a well-executed bunt, Clark moved to third and Dunnam eased into second. With the bases loaded, Bowman hit a Currie pitch right at Mullen at the shortstop position and Mullen was able to fire to Hailee Sherid an at home to catch Clark for the inning’s first out. Laney Lasiter was up next in the batting order and drilled one past Mullen which plated Dunnam, moved January to third and Bowman to second. The next batter was Fletcher – and with the bases still loaded – the Slocum pitcher grounded into a 5-2 force at home for the inning’s second out. Kara Cumby was up next for Slocum and she lofted a ball into shallow center field which allowed Bowman, along with Lasiter, to cross the dish and make the score 4-0. Ives followed with a double to score Fletcher and staked the Lady Mustangs to a 5-0 lead. While Currie seemed a little rattled, she calmed herself down enough to coax a pop up from MaKayla Bickerstaff to retire the Slocum batting order and turned the game over to her offense for a response. And respond the Sandiettes did. Staring at a 5-0 deficit, the Sandiettes rallied to score five runs in their half of the inning to tie the game. Sheridan led off the fourth with a base hit into center field and moved to second on Curie’s grounder through the middle of the infield. Reagan Bishop came in as a courtesy runner for Currie and chased Sheridan around the base paths when Hannah Chipman ripped a double off the right center field wall. Bishop stopped at third but came around to score on Madison Holbrook’s groundout back to the pitcher’s circle. Chipman advanced to third on the play and scored on McCombs’ liner into left to make the score 5-3, in favor of Slocum. With only one out, Haley Reed drew a walk and pushed McCombs to second. Next up was KeKe Harris who hit a shot that was bobbled at short just long enough to allow the freshman speedster time to beat the throw to first and load the bases. Mullen was the next batter in the Sandiettes’ line up and she grounded a 1-1 pitch to Bickerstaff at short who threw to Ives at third to catch Reed for the second out. On the play, however, McCombs was able to scamper home and cut the Slocum lead to 5-4. This time it was Fletcher who seemed rattled as she gave up back-to-back walks to Diamond Maines-Dunn and Sheridan. The walk to Maines-Dunn juiced the bags and when Sheridan walked, Harris trotted across the dish to tie the game at five. 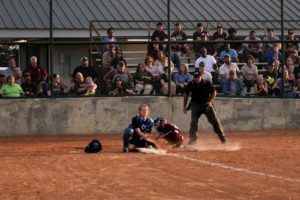 Fletcher was finally able to retire the side when she got Currie to line out to Bickerstaff, but the damage was done as the game moved into the fifth inning. In the fifth, it seemed as if Slocum might re-take the lead. Currie retired the first two batters she faced but gave up back-to-back-to-back hits to load the bases. Fortunately for the home team, she was able to force Fletcher to pop up to Chipman at third to end the inning. The Lady Mustangs had a much easier time in the field in the bottom half of the inning. Fletcher retired the first two batters she faced, gave up a single to McCombs and then coaxed a groundout from Reed to send the game into the sixth inning with the score still tied at five. As the lights began to flicker on, Currie got Cumby to line out to Mullen at first and coaxed Ives into a 5-3 force. Bickerstaff singled but was stranded at first when Clark lined out to left. The bottom half of the sixth saw the Sandiettes take their first lead of the game. Harr is and Mullen both grounded out, but Maines-Dunn managed to work an 0-2 count into a walk and then promptly stole second. In the world of baseball and softball, it has been said two out hits will get you to heaven. If that’s the case, Hailee Sheridan just rang the bell at the Pearly Gates. Sheridan followed Maines Dunn in the batting order and worked Fletcher into a full count. On the eighth pitch of the at-bat, Sheridan was able to get around on a Fletcher offering and ripped a line drive into center field that sent Maines Dunn flying around the base paths and across the plate with the go ahead run as the Sandiettes came all the way back from a 5-0 deficit to take the lead at 6-5. Currie grounded out to end the inning, but when she returned to the pitcher’s circle in the top of the seventh, she more than made up for it as she mowed down the Lady Mustangs in order to close out the game and give the Sandiettes the hard fought 6-5 win. Currie was credited with the win after going the distance, giving up 10 hits, five runs, striking out one and issuing one walk. Fletcher took the loss after pitching six innings, giving up eight hits, six runs, striking out one and walking four. At the plate, Grapeland was led by Hailee Sheridan who was 2-3 with a double, two RBI, a run scored and a walk. Madi McCombs was also 2-3 with one RBI and a run scored. Slocum was led by Jessi Ives who was 2-4 with one RBI while Shelby Bowman was also 2-4 with one RBI and a run scored. Kara Cumby went 1-4 with two RBI.